Iran - "It's not a strike, It's a campaign"
As the tensions continue to rise between Iran and Israel many Republicans continue to argue that the only issue of relevance is whether Obama has the guts to bomb Iran. Perhaps this video below on Fox News will make them appreciate that there is a little more to it than that. 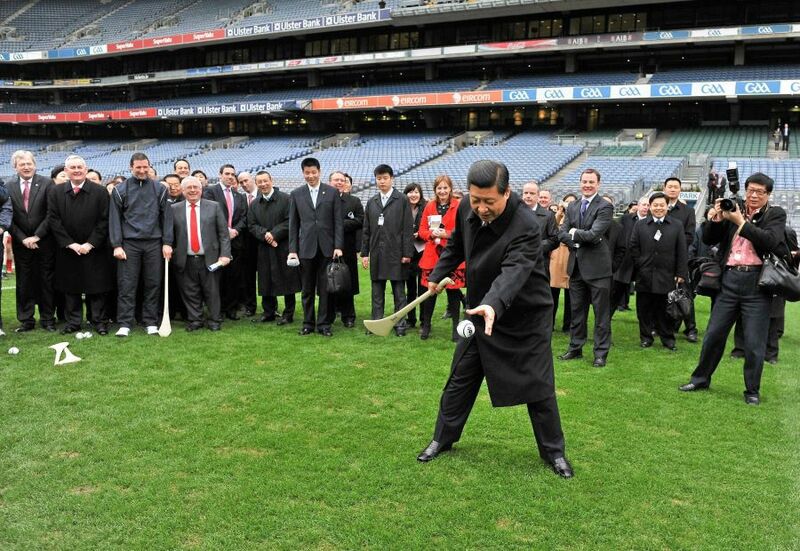 No foreign dignitary can set foot in Ireland without the standard photo op with a Hurley stick. 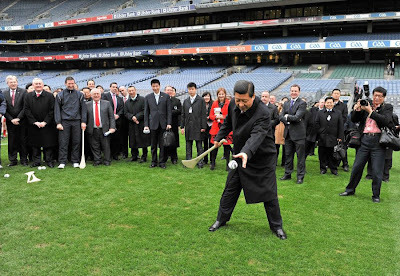 China’s Vice President Xi Jinping has just concluded a three day trip to Ireland. The man expected to be China's next Premier as of 2013 stopped off in Ireland on the halfway point of his round the world trip, the first stage of which was in the USA. He is now in Turkey. It is being rumored that the reason Ireland is the only EU country that Xi has visited is because the Chinese intend to use Ireland as their gateway to the European market in a similar way that many Americans companies have done. Several trade agreements have already been signed. The enormous Chinese economy is currently growing at 9% a year. Wouldn't we like to get some of that. In a recent robust discussion on the blog Seraphic Secret I argued the point that the United States should look for a "third option" when it comes to Iran. Allow me to explain. I fully accept that a nuclear Iran is an unacceptable security risk, particularly for Israel, and that if necessary military action should be taken to prevent it from happening. However an air strike against Iran might not succeed in destroying Tehran's nuclear programme and even if it did it could result in a wide range of conventional and unconventional retaliations in Iraq, Afghanistan, Lebanon, Israel and the Persian Gulf which could all have devastating consequences both in terms of human life and for the global economy. This is why I believe a third option is required, one which would remove the threat without war. The Israeli attempt at a third option appears to be a bold plan to wipe out the team of Iranian scientists working on the programme. Five unfortunate souls have so far been assassinated. An American third option is likely to be in the form of some kind of secret opening to Tehran in which they agree to verifiable abandon the nuclear option in exchange for economic incentives. However the hardliners in Washington and Israel seem to think that this is all cloud cuckoo stuff and that the Iranians are committed to obtaining the bomb and will only be stopped when they are forcefully confronted. Mr Avrech on Seraphic Secret quite reasonably pointed out that the Israeli attacks on the Iraqi (1981) and Syrian (2010) nuclear facilities met with zero retaliation. He went on to quote historian Niall Fergusson's recent article in the daily beast where he articulately makes the case that Iran's ability and will to retaliate is significantly overestimated. I was beginning to lose heart in my argument and in my own mind I was starting to concede that military action may be the right thing to do. But later that evening something occurred to me. There has in the past been a much more tense and dangerous nuclear stand off. One in which much more hung in the balance than the fate's of Israel and Iran. The stand off in Cuba in 1962 is generally seen as the closest the world has ever come to nuclear war. And on that occasion the hard liners got it wrong. During the Cuban Missile crisis it appeared that the safe and responsible option was to attack/invade Cuba before the nuclear war heads arrived on the island and the missiles became active. Kennedy decided against this opting for a blockade instead leading to a chorus of calls that he was a weak liberal who was incapable of standing up to the Soviets. Now watch this truly astonishing clip from the 2003 documentary Fog of War where Kennedy's since deceased Secretary of Defence Robert Macnamara explains how he found out in 1992 upon meeting with Fidel Castro that the nuclear war heads were already on Cuba at the time of the crisis. To sum up, after the Kennedy administration successfully negotiated the removal of the missile sites without war, US Air Force Chief of Staff General Curtis Lemay continued to argue that the US should bomb Cuba. Had he been listened to at any time during the crisis or indeed after it, I would probable never have been born. Perhaps the lesson is that the US should have a better intelligence capability. But I think the real lesson is that if there is a third option regarding Iran, all involved should try damn hard to make it happen. Because what if Niall Fergusan, Robert Avrech, John Bolton and other hardliners are wrong. Barack Obama's 2012 reelection campaign has not even gotten into first gear yet. And the latest figures suggest he will raise one Billion Dollars for this effort. The Republicans will have to get their act together very soon if they are going to beat him. Frankly, at this stage, I don't think they will. Below is what I think is Obama's first official campaign video for 2012. It was launched on the fifth anniversary of his announcement that he was running for President. And below is what I think is his second campaign ad. Its title, and sound track, "Start Me Up" is an indication of the momentum the Obama campaign team are hoping to kick start. Photo of the Day is back after a significant hiatus. Most of my upcoming Photos of the Day will be from my November/December period which I spent in the Cork Kerry area of Southern Ireland. I took this picture in the village of Sneem in Co Kerry. I was amazed to find out upon investigation that when Charles De Gaulle resigned the Presidency in April 1968 he retired to Co Kerry of all places. He spent four months in the tiny Kerry village spending his days taking long walks on the beach and working on his memoirs. 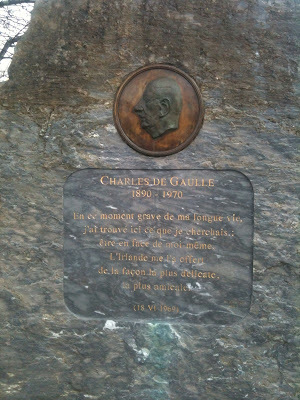 He returned to France later that year before his death in 1970, aged 80. I have never liked Horror Movies. Most of the famous ones still freak me out today as if I was a 10 year old. There is however one strange exception. I like zombie movies. I really can't explain it but I am a fan of George Romero's Living Dead series. I find them to be a weird and captivating combination of apocalyptic humor and horror and lets face it, who hasn't spent time imagining how they would fare out in an end of days scenario. So you can be sure I will be looking out for Osombie. That's right folks, Osama Bin Laden is back. In this movie he comes wading out of his watery grave to wage round two of his Jihad. Below is the trailer. Iranian Nukes, the no spin truth ! I have been blogging about this since I started Gubu World in 2008 but it really does seem that 2012 will finally be the year that the Iranian threat comes to a head. I find that the debate surrounding the Iranian threat to be full of platitudes and the commentary to be fairly lazy. So I have decided to lay it out as I see it in a clear and no spin way. 1. During the Second World War the Nazis invaded all of Europe, rounded up every Jew they could find in occupied territory and exterminated them in the most efficient and cost effective way, which turned out to be the gas chamber. Six million Jewish people were murdered this way. 2. Every Jewish family today has a story of a relative from the 1930s who used to say that you can't take this Hitler guy serious. It was believed, either through naivety or simply by underestimating humanities potential for cruelty that the Nazis either did not really mean to carry out their threat or would never obtain the capability. 3. After the Holocaust the Zionist theory of a Jewish homeland to protect the Jewish people gained enormous merit and the Jewish state was established in 1948 with one primary objection, to Never Again allow the Jewish people to be led to the slaughter by extreme bigotry and anti semitism. 4. The Islamic regime in Iran is fiercely anti Israeli. It has declared Israel to be an illegitimate state and that it should be wiped of the face of the map. The Iranian government appear to be on the verge of obtaining a nuclear weapons capacity. This would give them the capability to carry out that threat either by missile launch or via a proxy terrorist group that they sponsor. This is an unacceptable security risk for Israel. 5. Those opposed to military action against Iran seem to argue that the US and Israel are war mongering and that the threat is not that severe. They often argue that the threat to "wipe Israel off the map" actually got lost in translation somewhere between English and Farsi. This may be true but no reasonable person can expect Israel to rely on just hoping that Iran does not intend to carry out their threat. 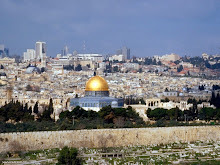 Given point Number 2 there is a strong belief within Israel that the government should take the Iranians at their word when they threaten to obliterate the Jewish homeland. Below is a provocative and disturbing video that was released last week in Israel which depict the consequences of a nuclear attack on the Jewish state. I want to make a few crucial points. We simply cannot expect Israel to rely on the good will of the International Community to protect it. We must consider the psychological legacy of the holocaust to understand why this is so. The last time the Jewish people relied on the world for protection six million of their civilians were herded into gas chambers. Back then the Jewish people didn't have a state to resist mass slaughter. Now they do and now they will defend themselves. It may seem like it but this is not a post arguing in favour of military action against Iran. I get angry when I see Republicans mocking Obama for not having the metal to do it as if that was the only issue. If the Iranian nuclear programme could be destroyed by military action it would have happened long ago. And even in the event of a successful strike we would no doubt see massive retaliation in Iraq, Afghanistan and the Gulf as well as via a host of proxies which would wreak havoc on the world and the global economy. This is why I suspect both Israel and the US are working on a third option. The Israeli version of this appears to be an attempt to wipe out the team of nuclear scientists working on the Iranian programme. The Americans I suspect favour some sort of secret approach to Tehran guaranteeing an end to the nuclear programme in exchange for economic incentives. Some call this appeasement, but if successful it would represent the biggest victory in US Foreign Policy since the fall of the Berlin Wall. Whatever approach is taken I would appeal to all sensible people to be on Israel's side on this issue. Be on the right side of history with it. Nobody wants to see another war and hopefully it won't come to that but ask yourself, would you prefer another Mid East war or another holocaust against the Jewish people on the conscience of the western world. Who does George Soros like ? I am fascinated in how negative associations and even unwanted endorsements can come into play in such a central way in US elections. Can someone explain to me why exactly George Soros is such a boogey man. Wow, I didn't see this coming. HBO are set to release a movie in the US this March about Sarah Palin and her bid to become Vice President of America in 2008. Juliane Moore plays Palin and Ed Harris plays John McCain. If the movie portrays Palin in a negative and condescending light, it could very well prove a boost for the Republicans who will be able to highlight, rightly in my view that liberals, particularly in the media often try to humiliate people with conservative views by labelling them as stupid. It could be used as a rallying point to fire up the conservative base, and firing up the base might be very much required if, as it seems from last night in Florida, that a "Massachusetts moderate" will be the Republican nominee. Having said that, the clip below doesn't appear to show a movie that is mocking of the former Alaska Governor.